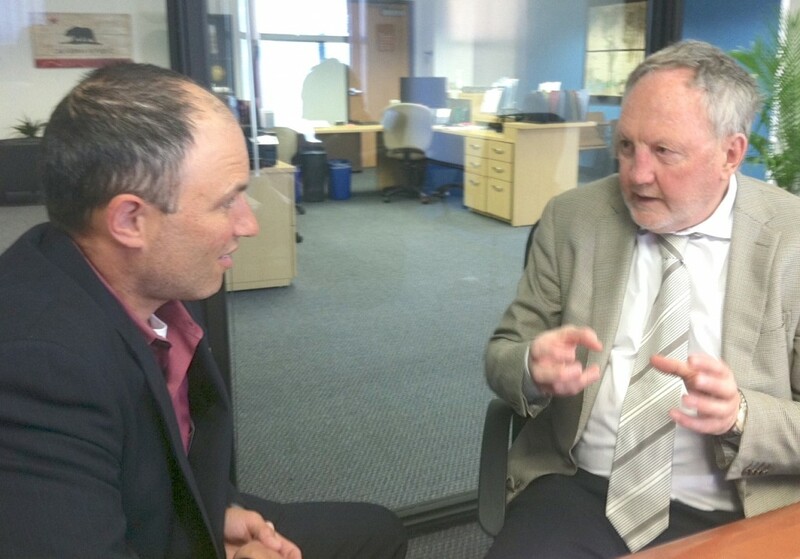 Rick Miller, left, executive director of the California Office to Reform Education, confers with Michael Fullan in Sacramento earlier this year. Fullan, a Canadian author on education reform, is the architect of the collaboration-focused model of school reform, on which CORE has based its NCLB waiver application. Photo by John Fensterwald. Representatives of nine California districts did not head home from Washington on Friday, after two and a half days of intense discussions with federal officials, with the waiver from the No Child Left Behind law that they had been hoping for. But Rick Miller, executive director of the nonprofit district collaborative that is submitting the waiver application, called the talks “productive” and said the districts are “one iteration away” from finishing a document for a final up or down decision by Secretary of Education Arne Duncan. Duncan did not participate in the discussions last week, Miller said. Hanson and Miller were joined in Washington by Superintendents John Deasy of Los Angeles Unified, Richard Carranza of San Francisco Unified, Christopher Steinhauser of Long Beach Unified and interim Superintendent Gary Yee of Oakland Unified, along with other administrators with the California Office to Reform Education, or CORE, the umbrella organization the districts have created. Thirty-nine states and the District of Columbia already have received waivers from some of the penalties of NCLB, along with flexibility to use some Title I money funded for low-income children. A half-dozen other states have applications under review. The nine CORE districts, serving about 1 million of the state’s 6.2 million K-12 students, would be the first districts to receive a waiver. Department of Education officials, cautious about setting the precedent of bypassing state authorities – the California Department of Education in this case – have moved slowly and carefully. Miller had said July 15 was the deadline for a waiver. If the districts don’t receive a waiver, they must renew contracts with providers of tutoring and other services required of schools that haven’t met NCLB’s academic targets. But Miller said Sunday that the drop-dead date is early August, when the first of the CORE districts’ school trustees meet to vote on the contracts. Waiting that long is not ideal, but the waiver is worth the effort, he said. A postponement won’t throw implementation off greatly, since the first year of the three-year waiver period will largely involve planning – including the accountability criteria and the designs of teacher evaluations. Districts have already been working together on implementing the Common Core standards, one of the requirements for a waiver, Miller said. The CORE districts are proposing a distinct approach to academic accountability and school improvement – one based on peer review and collaboration among districts’ teachers and administrators. This contrasts with having a state Department of Education in the traditional role of enforcer and compliance monitor. CORE would use some of the $100 million in freed-up Title I dollars to support the process. Approval of a district waiver would be controversial. Other state superintendents, who see a district waiver as undermining their oversight role, don’t like it. And teachers unions in the nine districts, angry that they were not consulted in writing the waiver application, have come out in opposition. During the past week, they pressed ahead. The presidents of local unions wrote their superintendents calling on them to withdraw the waiver application or at least delay it for a year. In those letters and in a letter last month to Gov. Jerry Brown, urging him to oppose the waiver, the unions introduced a new argument. They said that approval of a waiver “would divert funding and momentum from the implementation of the Local Control Funding Formula,” the K-12 finance reform that Brown proposed and the Legislature passed at the end of June. The “sweeping foundational changes implemented with the LCFF will take a back seat to the headline-grabbing approval of this consortium application,” the letter to Brown said. The waiver would create a “parallel universe” that would conflict with the goal of LCFF to align fiscal priorities and academic outcomes and undermine LCFF’s goal of involving parents, teachers and administrators in the creation of a local district plan. Brown has not responded publicly to the waiver application, and Evan Westrup, Brown’s press secretary, declined last week to comment on the letter. The State Board of Education endorsed the waiver in a vote earlier this year, before the passage of LCFF. Hanson said that the waiver, which will mute the negative impact of NCLB, is compatible with the new funding reforms. Both serve the same goal: directing more resources toward underserved students. Miller said the CORE application and the LCFF are “perfectly aligned.” The accountability metrics that the Legislature created with the formula and CORE’s range of academic and non-academic measures are similar enough that CORE districts will use the local accountability plan required by LCFF also to satisfy the federal reporting requirements. “I frankly do not see what they are talking about,” Miller said, referring to the union presidents’ letter. Will the waiver permit academic accountability that sets different goals for students in math and reading based on their race, economic status, ability to speak English and disabilities such as Florida and Alabama have? CORE Executive Director Rick Miller argued that CORE’s waiver application would commit to “robust accountability” for minority students, English learners and students with disabilities. If the waiver were granted as late as August, what changes would be made to the implementation schedule? I’m most concerned about the parts of the waiver application that call for providing support to focus schools and other Title I schools. Meaningful support can’t be organized days or weeks before school starts. Of course, this point is lost on school district administrators, who have made a habit of hiring and placing teachers and principals at the last minute, and who blame system constraints instead of acknowledging that removing or working around constraints is a big part of their job as managers. Both getting waivers and Brown’s new funding formula are nothing more than no accountability and no one watching the store. We were told recently in Fresno by Torlakson’s chief advisor that the new laws are nothing more than Education Realignment. Also, we were told that 80% of all funding for CDE comes from the Feds to monitor NCLB and RTTT. We were also told that there will be no monitoring by the state as there is no money. Brown’s new plan will be just like Criminal Justice Realignment in that the state will give the locals all the problems and the state will walk away. With more money and no accountability what do you think will happen when they waste and lie the way they do now? Better look before you leap. It’s really a pity that the CORE Districts developed this request without partnering with their local unions as there is much common ground within it. The fact that Mr. Miller, a board member of Parent Revolution, says he “doesn’t know what they’re (unions) are talking about” is due primarily to the fact that the District superintendents never bothered to talk to their local employee groups.